Uniquely Designed Knife With a Super Sharp Carbon Steel Blade. Sure this knife looks cool, but that's not the only reason why it makes a great addition to any kitchen. The sweet looking design of this knife is not just for show, it actually makes mincing and chopping a whole lot easier than it is with a traditional knife. It features a razor-sharp, high carbon stainless steel blade with a non-stick coating and a conveniently curved shape. This means that you will be able to easily cut through any vegetable or herb and achieve a clean and precise cut each and every time. The nonstick blade surface ensures that this knife will glide effortlessly through anything you are cutting, and even leafy green vegetables and herbs will release easily instead of sticking to the blade. The overall shape of this knife is incredibly ergonomic, perfectly balanced, and designed to be used with your choice of a one-handed or two-handed grip. Simply roll the blade across your food to mimic a professional rocking chop motion and quickly mince, chop cut and dice your food. This knife is perfect for nuts, herbs, vegetables and so much more. The ingenious and ergonomic Kulu Herb & Vegetable Knife rolls right through all of your mincing and chopping jobs. This will be your go-to tool for chopping onions, mincing garlic, dicing tomatoes and more. 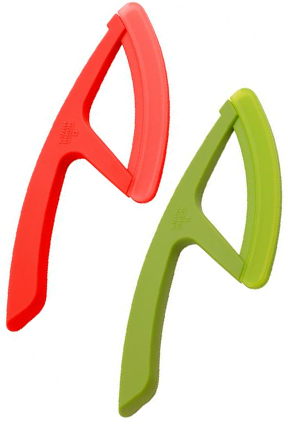 It is so easy to use, and really makes chopping vegetables a fast and fun task. It is actually a modern version of a traditional Eskimo knife, and it's inspired by an Inuit knife called the Ulu which is a powerful tool that utilizes a rocking motion to get the job done fast. You are able to hold it in several different ways in order to achieve the necessary amount of leverage for the job you are doing. This knife also comes with a convenient safety shield that is used for storage in order to prolong the life of the blade and keep your fingers safe while you are rummaging through the knife drawer. 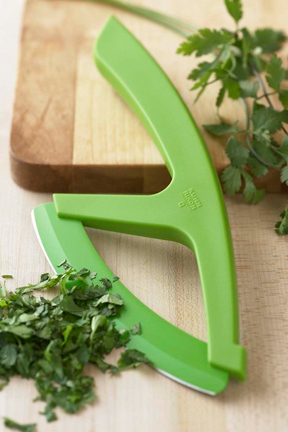 This uniquely shaped knife has a rounded blade edge that makes it easy to rock while chopping basil, mint, parsley, cilantro and more. After a single use, you will notice that the unique design of this knife provides a more natural feeling while chopping than your standard chef knife. It can handle piles of freshly picked herbs and stacks of garlic and ginger slices for the fastest and easiest chopping and mincing ever. 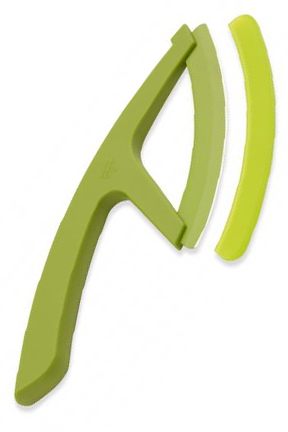 You will be amazed at how quickly and precisely you are able to chop using this advanced tool. The blade features high quality Japanese stainless steel and is sharpened for precision. This knife is designed for better control in all cutting tasks and features increased dexterity and leverage, making fine cuts simple and heavy chopping easier. A non-stick coating speeds up the mincing process by making sure herbs and vegetables don't stick. Kuhn Rikon is a Switzerland based company that is dedicated to producing the best in kitchen utensils and tools. In clean and simple design, Kuhn Rikon products bring color and quality to the kitchen. You've never realized how enjoyable meal preparation and cooking can be until you do it all with Kuhn Rikon in your hand. Order Yours Today! Overall Dimensions 10" x 6"
Bade Dimensions 6" x 1"
High quality materials and superior craftsmanship make this Swiss made kitchen gadget a must have. A great accessory for anyone that enjoys cooking. 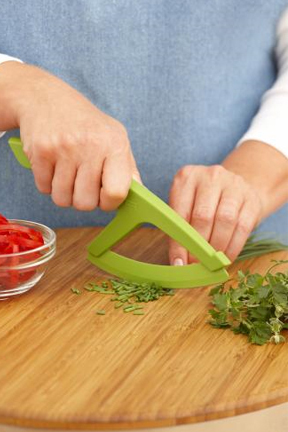 Discover the easiest way to chop and mince your veggies. Six Extra Containers For The Kuhn Rikon Grinder. Store cloves in a convenient location, and make them last longer. 4 Rings per set. Add beauty and elegance to your dining room with white porcelain napkin holders.